Riches. We all want them. Our society directs us to consume constantly, in a never ending cycle, never being happy. Never reaching "the goal." My profession is part of the problem. I’m a designer. We often help shill the things you really don’t need. We help make the unnecessary feel necessary, at least in many consumers’ minds. Thoreau lived from 1817 to 1862 and is most famous for his work Walden, which was a collection of reflections on simple living. This was in the first half of the 1800s – not the last half of the 1900s, or the first two decades of this century. It boggles the mind a little when you realize that people saw a problem with how we felt we had to live over 150 years ago. Over the last year I have taken a page from Thoreau (in a very small sense) and have tried (in a very small way) to simplify my life, or perhaps more correctly, take control of it. Working for myself was a major step. So was cutting down on monthly expenses by living more efficiently. Our foray last year into vegetable gardening was another. There’s a satisfaction you get from putting hand to soil that can’t be described until you do it. So is “making” rather than “buying.” Not only does it reduce expenses but it gives a feeling of self-sustenance and sharpens your mind to what is important. Success takes many forms. Being able to afford the latest and greatest is only one concept of it. Besides our small house in the country, we have a bachelor apartment in the city that my spouse uses for college and I use as a second office for my city clients. It’s small. It doesn’t have much except the necessities. We’re fine with that. The things one thinks they need are not in truth what is necessary. After second rise in the pan. Happiness, I believe, comes from fewer things, not more. If you can love someone, and be loved in return, what more is necessary, except for those few things required to keep you alive? He who has the most things at the end of the day does not win. In fact, the more you have can make you less happy. Picture a dog with four bones. There’s no way he can enjoy all of them simultaneously, so instead of enjoying one, he spends his time guarding all four, constantly afraid another dog will take them. Food for thought on a Thursday: What can you do without today to make yourself happier? Is it a simpler life, one in closer contact with nature and those you love? Would you sacrifice the hurly burly of your everyday existence for something “less” but far more rewarding? I hope my writing helps inspire you to reassess your priorities. For me it has worked. I am in a far better place now than I have been before. I am in control of my life, and responsible for my own happiness. 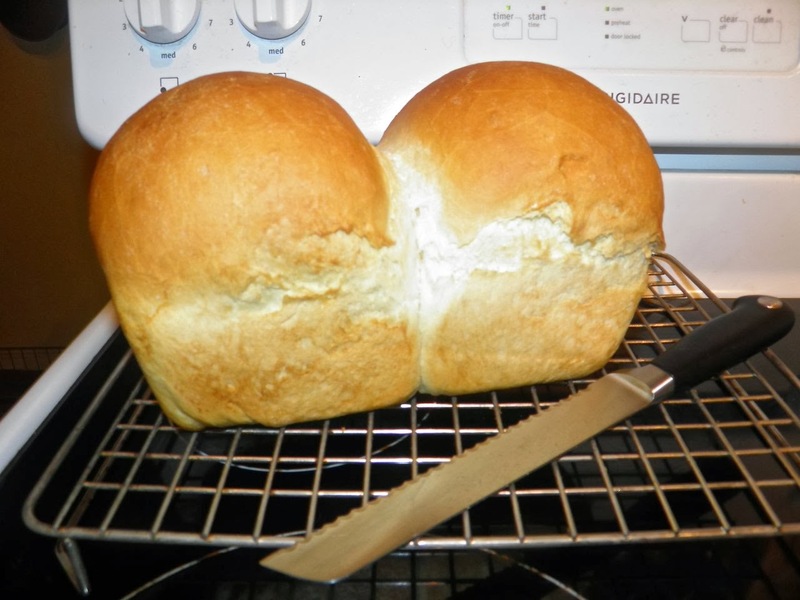 Bake some bread. Get in touch with a simpler way of life. Find some peace. A recipe for happiness? Self-sustainability. Proof the yeast in the warm water mixed with the sugar. Once the yeast is creamy (has activated), mix in the eggs. 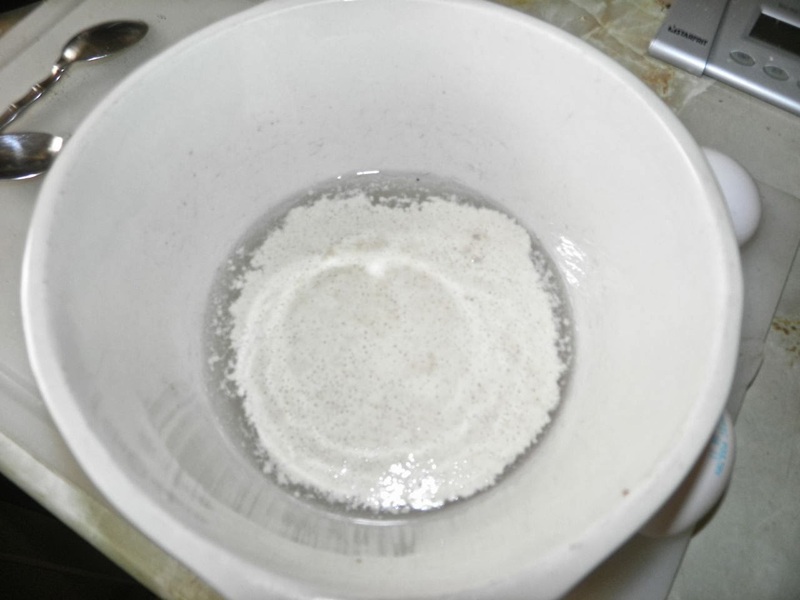 Pour over the flour and salt in a large bowl. Mix well. Once the flour has been incorporated, turn out onto the counter and knead for 5 minutes. Let rise until doubled, about 2 hours. 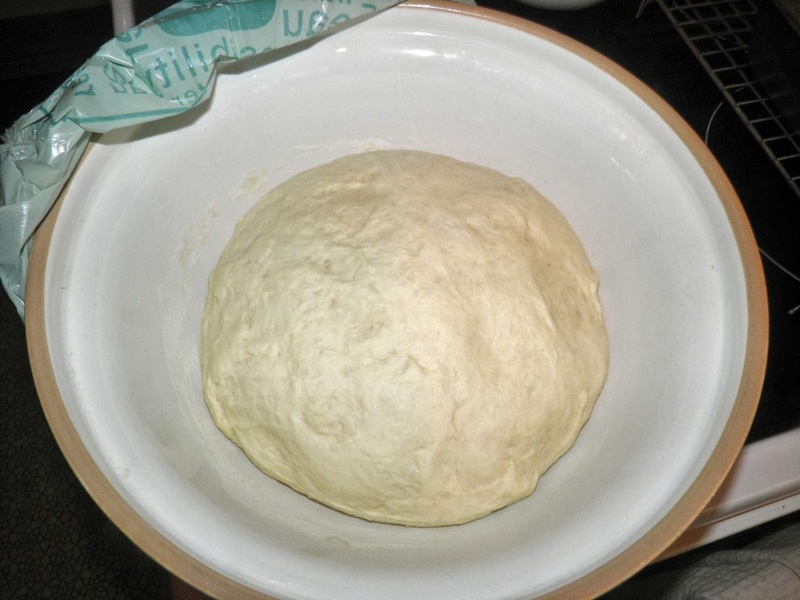 After the first rise, remove the dough to the counter again, divide in two and shape each piece into a round ball. 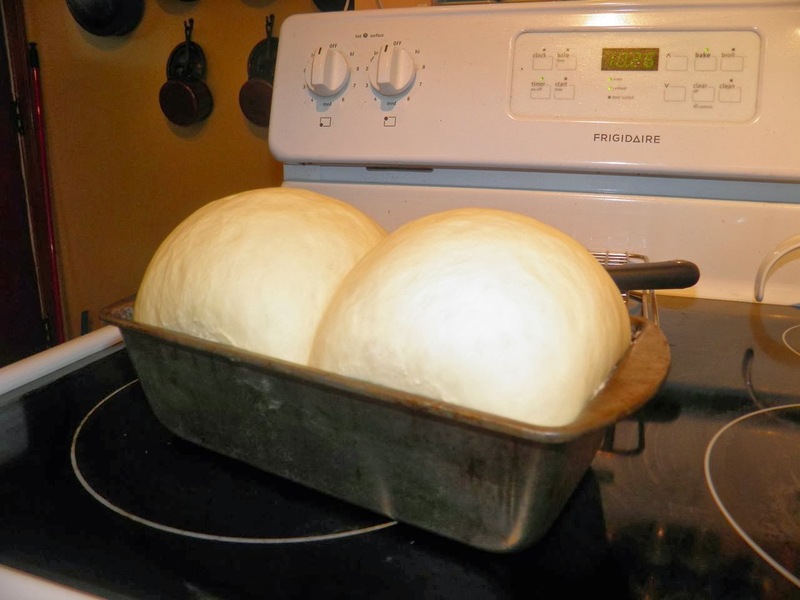 Place the balls side by side in a well greased 5x9 bread pan. Proof again until doubled, about 1 to 1.5 hours. Preheat the oven to 425°F with a pan with a little water in it on the bottom rack. 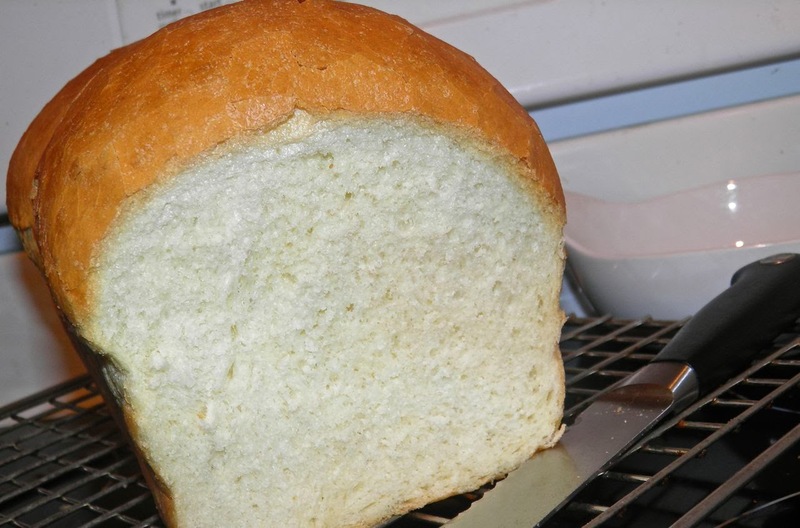 Bake the loaf for 35 minutes, until hollow sounding when tapped on top and nicely browned. For a soft crust, rub the top with butter.